Sen. Fasano was reelected to represent the 34th Senate District including the towns of Durham, East Haven, North Haven and Wallingford. 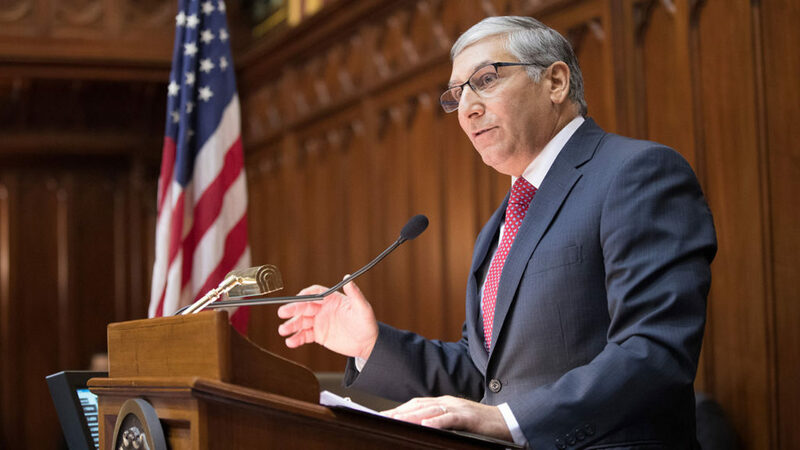 Senator Fasano addresses the Connecticut Senate on opening day of the 2017 legislative session. Governor, Madame Secretary, President Looney, members of the Senate, honored guests, today is a historic day for this chamber, and the start to a historic year for the state of Connecticut. Before I begin my remarks, I want to recognize that you can’t do this job without family support. I would like to introduce to the chamber my wife Jill and son Robert who are here today. I also have two other children, Karla and Kristen, who are both out of state and, if I may take a moment of personal privilege, I would like to announce that on December 13 my wife and I became first time grandparents to a beautiful baby boy named Griffin. I want to congratulate all the new senators: Senator Logan, Senator Somers, Senator Miner and Senator Suzio. All of whom have worked incredibly hard to be here today. I welcome them to this chamber, where they will represent the voices of their communities with honor, pride and integrity. I want to thank Senator Kevin Witkos who has served as deputy leader and Senator Bob Duff who have both worked hard to run this chamber. Senator Looney, I will get to in a moment. And to the Lieutenant Governor, we cherish the humor and dedication you bring to the Senate. As noted, this chamber is tied with 18 Democrats and 18 Republicans, a feat which has not happened since 1893. So when a tie occurred on November 8, many questioned whether or not we would have a functioning state Senate, whether or not we would be able to conduct the people’s business, whether or not we would be able to get along and work together. While other states when faced with a tied senate took a divisive path instead of working together, that is not the path we chose to pursue in this chamber. There should be no mystery as to why an agreement was reached to manage the Senate together. The agreement that will guide our Senate chamber is rooted and formed from the friendship that Senator Looney and I have shared for over 30 years, before politics entered our lives. As lawyers often tell their clients, no matter what a contract says if you don’t trust the person on the other side of the table there is no contract that could ever be written to fully protect you. Trust is a fundamental piece of any agreement. And when it comes to Senator Looney and me, we trust each other. That certainly doesn’t mean we agree on all policy issues but what it does demonstrate is that trust, admiration and respect raises us above politics. We all know what Senator Looney went through a few short weeks ago. We are all so glad to see him here today. It is remarkable that he can join us in this chamber. Even more remarkable, within 24 hours of his surgery, he was on the phone with me working out all the final details of the agreement that only he and I could resolve, based upon our level of trust. This agreement will make us a stronger chamber because it requires conversations, compromise, understanding and the exchange of ideas that one could argue has been missing from not only this chamber, but missing from all of government for far too long. There is not a doubt in my mind that all members of this chamber have the best intentions and share the goal of improving the state of Connecticut. While we may take different avenues to reach that goal, this agreement will almost insist upon collaboration to achieve that end. I am always proud of the work ethic and the debate we have in this chamber on each session day and although I may disagree with some of the policies that pass, I will never question the motive behind the results. I am proud to stand before this chamber of equal parties today. I am proud to commit to working together to face the challenges that we all know are coming. This is a great state with great opportunities. But there is much more we can do for our state. To start, we must reach into our cities and bring hope where there is despair, push for opportunity where people feel disenfranchised, educate our youth for the jobs of tomorrow, and make prudent and responsible investments to ensure that everyone is truly given a chance to be successful. And for those who need a hand up, we need to preserve core government services for people most in need. We cannot be content with saying we are “open for business.” We have to acknowledge that there is an exodus of people from our state, and we must stop this exodus by sending a message early that we understand the issues facing this state and we will take action. We have to legislate both a short term plan and a long term plan that demonstrates a commitment to growing jobs and the economy to make Connecticut a better place. We must propose and pass legislation that reduces burdensome regulations and ends policies that scare businesses and jobs out of the state. First, we need to take the next 30 days to address the current fiscal year’s budget deficit. Second, we need to develop a budget for the next two fiscal years. And third, we need to chart a course that future legislatures can build upon so we can move the state into the next decade. As Winston Churchill said: “He who fails to plan is planning to fail.” It’s time to think ahead and stop budgeting for elections and start budgeting for generations. All of these goals bring us to the most important goal – we need to restore confidence in our state. If people are confident that our state is a stable place with opportunity for all people, where people of all economic levels can achieve success, a place where people have a ladder out of poverty, a place with a sustainable and predictable budget allows businesses to plan for future expansion, then we can make real strides to make Connecticut a better place to raise a family, obtain a job and run a business. There is no doubt in my mind that this chamber collectively can meet those goals. The strength in this chamber comes from the members themselves. I have witnessed this chamber to do remarkable things. We all have strong voices, with strong opinions and strong resolve. But we must remember that our voices are strongest when raised together. When all ideas are heard – when all avenues are explored – that is when the best legislation is created. I am proud to serve with each and every one of you and together Democrats and Republicans can surge Connecticut forward. May God bless this chamber and may God bless the state of Connecticut.